This is yet another two in one recipe in a mix . 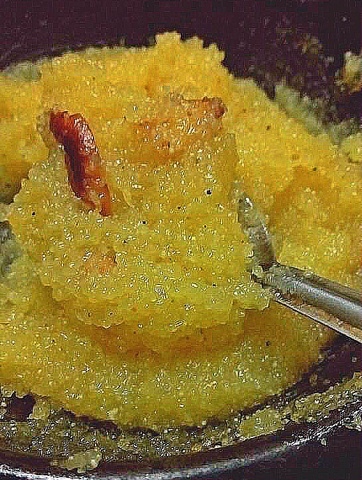 You can make instant kesari within 3 minutes and also use the same mix to make quick rava ladoos . 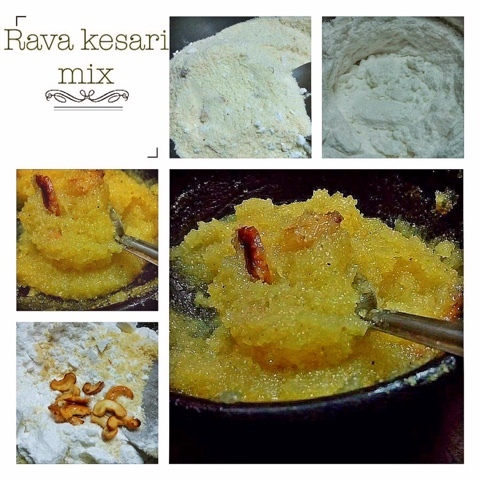 Why and how to use this instant rava kesari mix ? 1.. Helps to make small single servings of quick dessert when required . 2. Helpful during pooja days and quick neivediyam . Many of us make small quantities of kesari for Prasad for Sai Baba ( example ) if you have this ready to make mix on hand just take 2 heaped tbsp of this mix , add 4 tbsp boiling water , keep on low flame covered and within 2 minutes yummy kesari is ready . 3. Extremely helpful when your kids demand a sweet . 4. Useful to carry on trips and send with your family members . 5. Just needs 4 tbsp hot water for 2 tbsp of this mix for a single serve in a mug . Keep in microwave for less than a minute and tasty kesari is ready . 6. Recipe is good to make rava ladoos too . If using the recipe to make rava ladoos then roast the sooji / rava and powder it . 7. People in temporary residences with minimum vessels will find such mix easy and useful . All you need is a microwaveable mug ( for use in microwaves) or a small pan if using gas . 8. No need to add anything except boiling water. So your hubby and kids can make yummy kesari by themselves . This instant mix comes handy during festival months . When you have unexpected guests for lunch you can make this dessert within minutes. Roast sooji with ghee till pale golden and fragrant . Add saffron strands , powdered sugar , cardamom powder , roasted cashewnuts and raisins , mix well . Store this kesari mix in an airtight container. For a single serving in a small cup for an individual . Take 2-3 heaped tbsp,of this kesari mix . Add very hot boiling water about 4 tbsp and cover and keep on a low flame in gas . Within 2 minutes the water is completely absorbed and kesari is ready . Remove when kesari mixture is a bit loose in consistency as it will become thick naturally on cooling . Microwave In a microwaveable mug till mixture thickens . Kesari will be ready in a minute . No need to add extra ghee or any ingredient . For extra richness you can add if needed . As this is a travel recipe we assume you do not have any other ingredient except the mix . However if preparing kesari at home you can add more ghee if you like . Serve yummy hot kesari . The same mix can be used to make instant rava ladoos . If you plan to use same mix then make sure to powder roasted sooji and use the same for both kesari and rava ladoo .. The prepared mix will last good for upto three months .